Leading The Way To Zero Waste! Peña’s Disposal Service provides innovative recycling and disposal services with zero waste as the ultimate goal, through cutting-edge technology, community education and staff training. Peña’s is committed to being the best by challenging the industry’s standards for excellence. The family-owned company has been in business since 1949, and has grown and added new services and technology as part of the goal to achieve Zero Waste – three generations strong! household hazardous waste; and offers CRV buy-back at several locations. Businesses that generate four (4) or more cubic yards of garbage per week and multifamily apartments that have five (5) or more units are required to recycle under state law AB 341. Call Peña’s Disposal today for a free waste assessment to see if your business is in compliance. 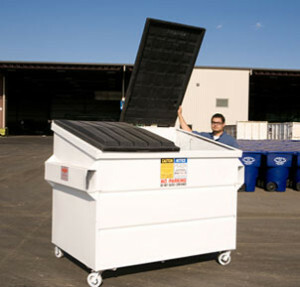 Learn more about Mandatory Commercial Recycling. Mandatory Organic Recycling is HERE – find out more! Today the Dinuba Women’s Club held their annual VIP luncheon that raises money for April 13th Dinuba Relay for Life. We here at Peña’s Disposal donated a Water Hose Wine Basket. 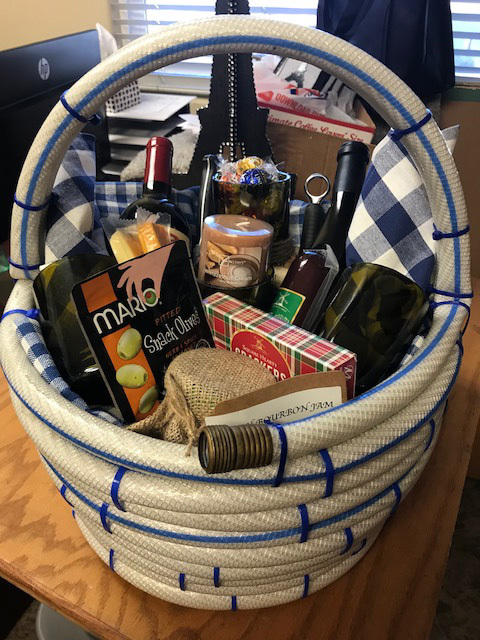 We filled the basket with recycled wine bottle wine glasses, wine bottle candy dish, and wine bottle candle holder. It also had a picnic blanket, napkins, tasty snacks, a knife, wine opener – and of course – there was wine!!! Art Peña was a VIP and came in first in raising over $500 for Dinuba Relay for Life, so he gets bragging rights until next year! © 2019 Peña’s Disposal Service. All Rights Reserved.